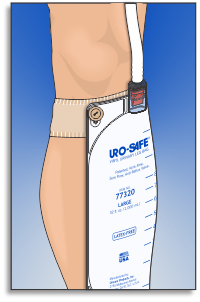 disposable leg bag with the new Fitz-All® urinary leg bag strap. This universal fabric leg strap will fit most vinyl disposable urinary leg bags and offers a vast improvement in comfort over the standard latex leg straps packaged with most vinyl leg bags. A special elasticated-loop material distributes pressure evenly along the length of the strap reducing the risk of bruising, pressure sores, pulled hair, circulation restriction and burns caused by rubber straps. Large buttons can be easily grasped and slipped through the eyelets of most all vinyl disposable leg bags. 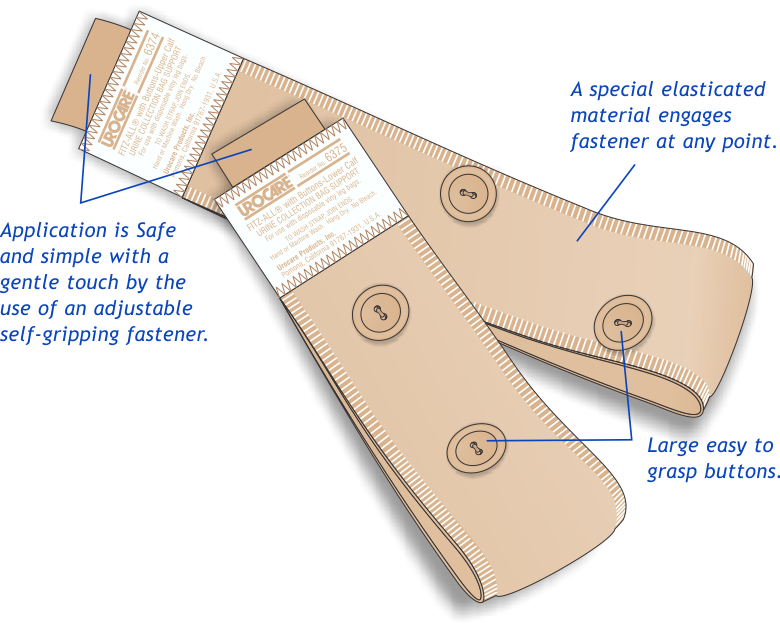 The self-gripping fastener can engage anywhere along the length of the strap making the strap fully adjustable to individual requirements. A special blend of elastic and cotton makes them durable and allows them to be hand or machine washed. ‡ Approximate volumes in fluid ounces (fl. oz.) and milliliters (ml.). * Bags must have eyelets for buttons to pass through.